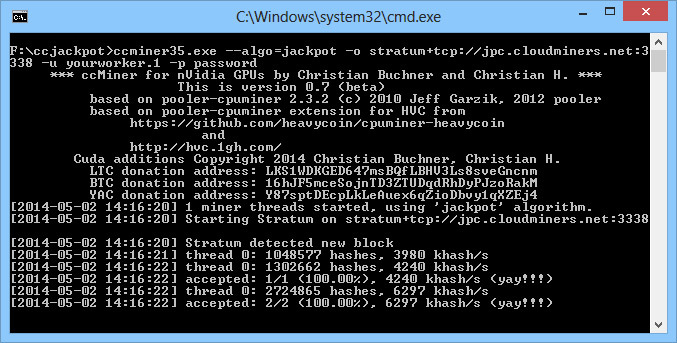 The ccMiner software miner for Nvidia GPUs has received an update to version 0.7 (source) adding support for Jackpotcoin and Myriad-Groestl. The new official release contains multiple versions for various GPUs, but do note that currently older Compute 2.0 hardware is not yet supported. Our test has shown a hashrate of about 7-7.2 MHS for mining Jackpotcoin on a single GTX 780 Ti GPU, so the performance you can expect mining JPC on Nvidia hardware is better than what the AMD GPU miner for JPC can currently provide.